Breastfeeding in Public! So, what? By now you’ve seen this picture of a young lady breast-feeding her child during her graduation ceremony. For obvious reasons this has caused an online stir. (Read more about her response here, https://gma.yahoo.com/blogs/abc-blogs/mother-defends-breastfeeding-her-baby-during-graduation-212933746–abc-news-topstories.html.) I honestly don’t see what the big deal is with a woman breast-feeding her child in public. Why do people empathize with pictures of animals breast-feeding their young, but when people see pictures of women breast-feeding a human being, it’s a problem. Breast-feeding is very natural and does so much for the baby. Plus, it’s better than formula feeding your baby. Women who choose to breast-feed should be commended on that choice. People find fault in the craziest things though. Did people really expect this mother to say no to breast-feeding her child? The child was hungry. Some may say that the graduation ceremony was not an appropriate time to breast-feed. Why? Is it because people, for whatever reason, have become uncomfortable with the sight of a mother providing nourishment to her offspring? In my opinion, that seems like a personal problem. A baby should be able to be fed whenever and wherever. No one can dictate when a baby will become hungry, and it would be a crime to not provide the baby with a necessity because it may offend others. It’s just not a respectable expectation. So, find something else to condemn. And to the people who connect the innocent act of breast-feeding to a sexual act, you seriously need to grow up. 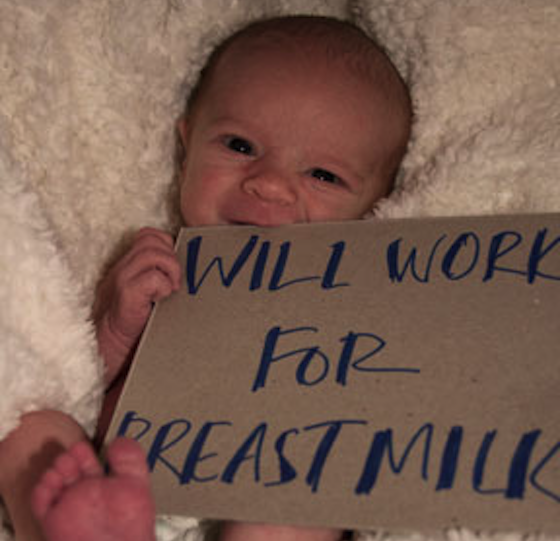 Posted on Tue.Jun.10.2014, in News & Opinion and tagged #Moms, #StandforBreastfeeding, #WomensRights, Babies, breast-feed, BreastFeeding, Breastfeeding in public, breasts, Discrimination, graduation ceremony, Mom, mothers, Nurturing, Offspring, Women's Rights. Bookmark the permalink. 6 Comments. I am so glad you chose to write on this subject. To be honest all the critics in my opinion demonstrate exactly what is wrong with this world. She isn’t being sexually explicit. She is providing nourishment to her child. People lack values and maturity in my opinion. It is a growing problem of people having values all messed up. It’s ok to see a woman showing her stomach with booty shorts and half of her breasts out but not a mother breastfeeding her child. I get it it was graduation. Even then I still don’t see a problem. She is proud as I would be. It is hard enough going to school. Even harder, having kids, being pregnant and having a newborn and going to school. I did it twice so I know and can relate to her being proud. Don’t see an issue. Just immaturity. For those woman who cover their childrens eyes when they see a woman breastfeeding (I’ve seen that before) you do more damage to your child. Why not explain this is the “natural” thing to do. I had to write about it! The only people who would be upset, in my opinion, would be people who are immature. To piggyback off what you said, no one is complaining about all the scantily-dressed women who post pictures online. I mean at least their purpose behind breast-feeding. There is nothing wrong with breastfeeding in public. Yes, breastfeeding is natural and most people do not have a problem with it, but we live in a country that does not accept exposure of body parts as the norm. I have breastfed many times in public, but for me it was a personal experience and therefore I covered my breast and my baby’s face with a light cover up. Thank you for sharing, and letting me know that I was covered when breastfed in public. lol! I believe there is more to it than a picture. I have no problem with it, but the problem with it is that in this country it has become an extreme. In other countries, breast feeding is normal, but here it’s like the best new thing to do. So in turn, people are becoming more educated and you stated great facts in your post, but it’s becoming a bit extreme lately. Breast feeding does have great benefits but that does mean post a selfie to show people your choice so you can prove something. As I approach giving birth, while I have made a decision to breast feed, I read about women who either can’t or choose not to and they are made to feel really bad about it. It is also forced on women who are made to feel bad for not doing it. There is plenty of help out there, but at the same time, it is kinda pushed on women these days. It’s all I read about when I’m not even looking for it. Granted, I think breast feeding is a great thing (even with its drawbacks) but it’s not everyone’s business either and I wish this country didn’t treat it like a new way to be cool. The one thing I do appreciate most about this picture is that it can be motivation for black women, especially young ones. Otherwise, I can see her areola and find that to be disturbing. Thank you for sharing. I can definitely understand your point of view.